Sun city: Hopland (pop. 1,756) uses the most solar power per capita in the world. Where is it? Right off U.S. 101, tucked into the hills of southern Mendocino County. Best time to visit: Late April, when the Solar Living Institute throws its Earth Day bash (free; 13771 South U.S. 101; ), complete with live music, garden demos, and organic food-wine pairings. For a quick run-through: Check out the tipi, power-generating bikes, and vintage cars turned tree planters on a free guided tour. The vibe: Floppy-hatted Sierra Clubbers and in-the-know day-trippers taking advantage of the 12 lush acres of primo picnic space and on-site winery. Mmm, what’s that … ? The center’s biofuel pump is filled with veggie oil recycled from nearby restaurants. So that really is french fries and tempura you smell. 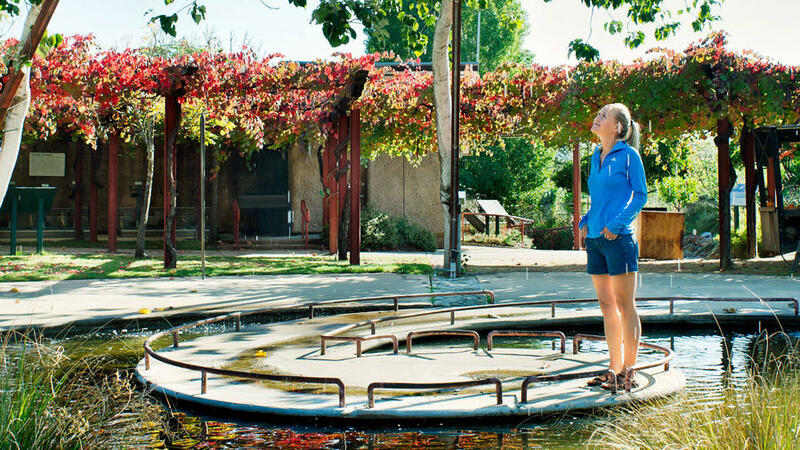 Get centered: The Central Oasis, located near the Solar Living Institute’s Real Goods Store, is a tree-shaded picnic area with a pond that serves a higher purpose: The trickle of water from the pond and connecting waterways mums the hum of cars zooming by on the adjacent U.S. 101, and a combo of algae-eating fish and plants keeps the pond healthy and clean. Green grocer: The Real Goods Store calls itself the “Greenest Store in the Universe,” and we’d roll our eyes if the building weren’t made from straw bales, or the goods weren’t Mother Nature–approved: hand-crank blenders, water-powered radios. The store also has loaner picnic blankets and vegan munchables. 13771 South U.S. 101; 707/472-2403. Make it a weekend: A short walk from the institute, Piazza de Campovida hotel overlooks the lush Coast Range. Mediterranean-style rooms come with fluffy robes and hot tubs, but your time might be better spent downstairs at soon-to-open Pizza e Birra ($$), a brewpub with thin-crust pies and pints made in collaboration with Oakland’s famed Linden Street Brewery. From $185; 707/744-1977. If the weather’s nice, swing by Brutocao Cellars—a 1920 schoolhouse turned tasting room—for a sip of Quadriga, a blend of four Italian varietals, and a match or two on one of their six regulation-size bocce courts. No tasting fee; 13500 South U.S. 101, Hopland; 707/744-2000. Bluebird Café is revered for its homemade apple cinnamon bread, the foundation for the must-have French toast. Pies are great too: flaky, hot, and made on-site. There’s none better than the blackberry crumble. $; 13340 South U.S. 101, Hopland; 707/744-1633.